Trades made after last Tuesday will be discussed in the next post, with the exception of a 50 share purchase of IRT made last Friday (Item # 5 below). I stopped writing this one after discussing 7 trades. I am placing more emphasis on income generation this year. The goal will be to increase my income generation by at least $5,000 annually. The easiest way to accomplish that task would be to invest slightly more than $70,000 in securities with a weighted average yield of 7%. That would be the easy way to do it. I will not do it that way. Last Thursday, when the S & P 500 sank .89% and TLT was up +$1.49 or +1.42%, my bond heavy retirement accounts were net positive. The more balanced main taxable account was down .32%. The decline last Friday, which was more severe, resulted in almost a 1% decline in taxable accounts and a .6% decline in my retirement accounts. Although the intermediate and long term treasury bonds gained in value last Friday, other bond classes fell in price and rose in yield (e.g. : LQD ETF for Investment Grade Corporate Bonds: 115.36 -0.08; JNK: 40.59 -0.30 SPDR Barclays High Yield Bond ETF) I also suffered a greater decline in my stocks last Friday, as the S & P fell 2.09%. 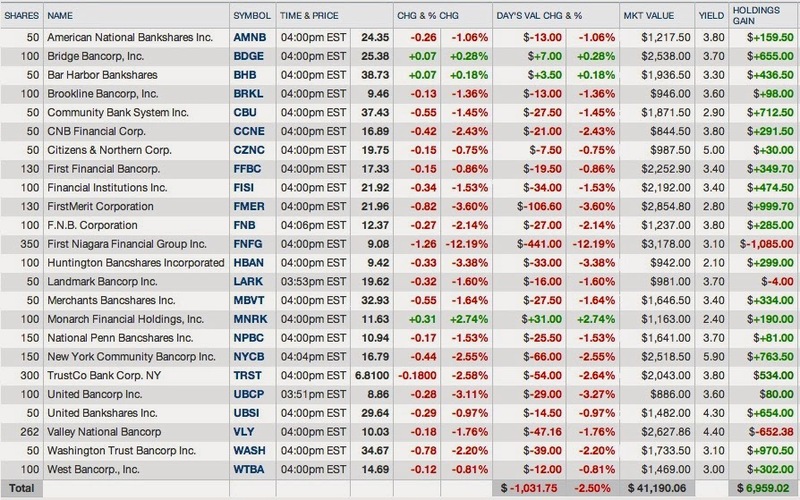 Overall, I am satisfied with how my portfolio responded to last week's events. Emerging markets have started 2014 on a sour note as investors become more concerned about China and turmoil in several emerging markets including Thailand, Turkey, Ukraine, Egypt and Argentina. Commentators are starting to hyperventilate about emerging markets, referring to them as falling knives (e.g. Ben Levisohn's column: "Stand Clear of Falling Knives" - Barrons.com). The commentary from "experts" both reflects and feeds the fear (e.g. Bloomberg). Some of those countries, like Argentina, have been basket cases for my entire life. The problem for emerging markets started back in May 2013 when the market first became concerned that the Fed would soon start to taper its abnormal asset buying spree. The herd's consensus opinion was that a significant part of the excess liquidity provided by the FED was finding its way into emerging markets and was helping those countries with current account deficits to finance those deficits. Without that flood of money, the herd believes that the currencies of those nations will have to decline substantially to alleviate that pressure caused by a withdrawal of foreign funds. The weakness in the currencies causes other investors to sell emerging market stocks and bonds and to repatriate their funds. Turkey is running a current account deficit. A significant hike in interest rates can draw funds back into Turkey but that option may curb growth. All of the foregoing was aggravated by concerns that China's growth was slowing and its shadow banking system was a replay of the U.S. subprime lending fiasco. Even if China could weather the improvident extension of credit to finance GDP growth, the consensus was that debt expansion could no longer responsibly finance China's growth and those emerging market countries that depended on selling commodities would suffer as China's demand for raw material subsides, as it focuses more on consumer demand than on infrastructure projects. The bond forecast is based on interest rate normalization and assumes an average annual CPI rate of 2% to 2.25% over the next ten years. Bonds continued to rally last week due to growth concerns and overall lackluster 4th quarter earnings from several multinationals. Jon Hilsenrath, who seems to have some kind of pipeline into the FED, opined in a WSJ article that the FED is on track to trim its bond buying program notwithstanding the weak jobs report. The next pare of $10B could be announced at the end of the January 28-29 meeting. One of China's shadow banking trusts, distributed by the Industrial & Commercial Bank of China, is about to default. Bloomberg It is hard to say how many more of these financing vehicles are set to implode. The Markit January flash U.S. manufacturing PMI was reported at 53.7, down from 55 in December. The Markit PMI numbers for Europe showed continued improvement. The January manufacturing PMI was 53.9, a 32 month high. Inflation is out of control in Venezuela also, and the government is forcing small businesses to lower prices. Bloomberg That government calls small businesses "parasitic bourgeoisie". The problems in both Venezuela and Argentina are caused by inappropriate government policies. Last Thursday, several emerging market currencies dived in value against the USD. WSJ.com The Argentinian peso declined 16%. WSJ.com That government routinely fudges inflation numbers. Actually, fudge is just a way too kind. The Turkish lira fell to a record low last week. The possibility of a 1997 styled bloodbath, known generally as The Asian Contagion, is a possibility this year, but I do not view it as likely. The possibility exists even though there will be temporary reprieves. The 1997 Trigger Event was caused by the crisis in Asia but the longevity of the Unstable Vix Pattern (October 1997 to January 2004) was due to a host of factors. The Asian Contagion did highlight the problem of too much debt which would become a recurring problem thereafter. Nations and consumers will run into really serious problems at some point in a debt acquisition cycle. The weakest and smallest nations will just hit that ceiling first. I am going to keep my severe underweight position in both emerging market stocks bonds for awhile longer. Several emerging market ETFs can be purchased commission free, and I am not adverse to buying 5 or 10 shares when that can be done without a brokerage commission. I did sell last year the low cost Vanguard FTSE Emerging Markets ETF (expense ratio .18%), which I can buy commission free in my Vanguard brokerage accounts. Sold 65 VWO at $41.75 (October 2013). I would add, just to emphasize the risk, that I sold 100 shares of VWO at $50.22 in April 2011. Risk and opportunity frequently go hand in hand. Unilever reported underlying 4th quarter sales growth of 4.1% (volume +2.7%; Price +1.4%). Underlying sales growth in emerging markets was 8.4% with volume contributing 5.3%. This was an increase from the 5.9% growth reported in the 2013 third quarter. For the full year, core earnings increased 3% to €1.58 per share. In constant currencies, core earnings increased by 10.6%. GAAP E.P.S. for 2013 was higher due to some brand disposals. The report is discussed in a Reuters' article. Both UN and UL go ex dividend on 2/5/2014. The quarterly dividend will be $.3654 per share. Santander Consumer USA Holdings (SC) had a successful IPO, selling $1.8B in stock at $24 per share. At the new monthly rate, the dividend yield at a total cost per share of $12.74 is about 7.85%. While I am currently content to keep what I now own, I am not flowing with praise for this company that slashed its dividend during the recent recession. ($.31 to $.1, General Electric Company (GE) Dividend History). A number of SeekingAlpha contributors are far more infatuated with this company: Seeking Alpha. My current intention is to sell 172 shares somewhere between $30-32 that will lower my average cost per share to around $15. (see snapshot in the introduction to Stocks, Bonds & Politics: GE showing the shares remaining after any such pare as of 12/2012). I seriously doubt that GE will hit that price range in 2014. 1. 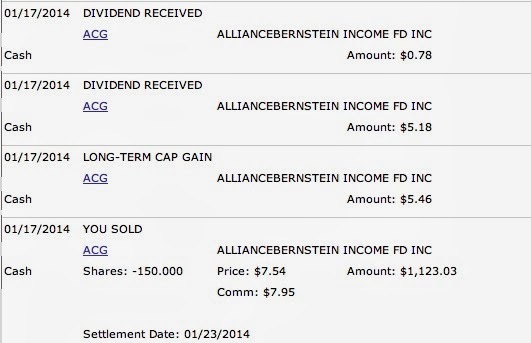 Sold 50 SANPRB at $19.8-Highest Cost Lot ROTH IRA (see Disclaimer): This trade generated a profit of only. I do not make snapshots of trades that generate less than $30 in profits or losses. By selling my highest cost shares, I netted only a $8.48 profit on the shares. Security Description: The Santander Finance Preferred S.A. Unipersonal Floating Rate Gtd. Pfd. Series 6 (SAN.PB) is an equity preferred stock that pays non-cumulative and qualified dividends at the greater of 4% or .52% above the 3 month Libor rate on a $25 par value. Prospectus Given the long standing Jihad Against the Saving Class, likely to continue for several more years, the current applicable coupon now and for the foreseeable future will be 4%. Rationale: I am playing small ball with equity preferred floating rate securities. The general idea is to at least make an effort to play their natural volatility. 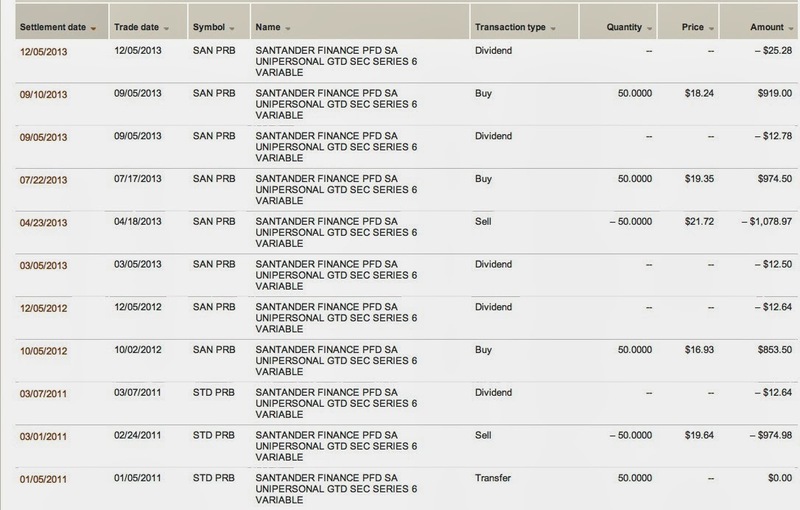 If and when SANPRB dives back down in price, I will consider buying back this 50 share lot. The price would need to decline below $17.5 or so, since my remaining 50 share lot held in the ROTH IRA was bought at $18.24. If I do buy back the shares at less than $17.5, then I would consider selling the 50 shares bought at $18.24 at a higher price than $19.8 and so on, at least until I see no further advantage likely to arise from playing this particular game. The reason for playing small ball in this sector include an analysis of the following factors: (1) these securities are naturally volatile in price and are consequently appropriate vehicles for this slice and dice into small orders trading strategy; (2) it is uncertain how many more years the minimum coupon will be in effect and (3) their low priority in the capital structure. If I knew that the Libor float would likely raise the coupon rate within the next year, I would be far more inclined to hold these securities, since I would anticipate a move in price toward par value. Unfortunately, I can not anticipate that happening now before 2017-at the earliest. I ended up with 80 SANPRB shares in a taxable account and decided to refrain from playing small ball with those shares, which were bought at $13 (August 2011) and at $15.44 (November 2011). I am just keeping those shares. The price is viewed as sufficiently low enough that I am satisfied with the end result. Rationale-The Cockroach Theory: Royal Dutch gave a profit warning on 1/17/14 that caused me to eliminate my position. There were simply too many negatives in this warning that just significantly undermined my rationale for owning this stock. A dividend cut in 2014 or 2015 is a realistic possibility in my opinion. I am generally not willing to give a company the benefit of the doubt after such a development. Instead, I will assume that further negative developments are in store for those willing to be patient and to have more understanding. When a few cockroaches are seen, an infestation is likely, an observation known at the Cockroach Theory when applied to companies. Shell will need to prove to me now that it is not a cockroach hotel before I will buy back any shares. The warnings is discussed in several news articles: Forbes, WSJ; NYT; CNBC. Institutional investors took the warning in stride. Possibly, many of them believe that the new Shell CEO is clearing the deck and may be more inclined to be more circumspect in capital allocation decisions than his predecessor. Rationale: Alcoa's stock has been on a tear recently. AA Interactive Chart On 10/3/13, the stock closed at $7.86. The increase to $11.36 gave me a profit after having a loss for several years. While AA has upside potential as a turnaround, I decided to take my profit and head for the hills. The recent upswing probably has to do with the launch of the Ford F-150, made out of aluminum rather than steel. Alcoa recently completed a $300 Million expansion at an Iowa plant to provide aluminum sheet metal to the automobile industry. On the first trading day after selling my shares, Alcoa's common stock rose another $.77 to close at $12.13. JPM raised its rating to overweight from neutral and increased the target price to $15 from $9, based in part on improvements in the aluminum price. Another consideration is the lackluster earnings reports and valuation based on current E.P.S. forecasts. The consensus E.P.S. estimate is for $.3 in 2014 and $.57 in 2015. AA Analyst Estimates At a $11.36 price, the P/E on estimated 2014 earnings is 19.93. For the 4th quarter, Alcoa reported GAAP E.P.S. of $.02 or $.11 excluding items. SEC Filed Press Release As of 12/31/13, 16% of smelting capacity was offline. The engineered and rolled products continued to show relatively strong results and are at least keeping AA profitable. Subsequent to that release, Alcoa settled with the DOJ and the SEC matters relating to "certain legacy contracts with Aluminum Bahrain". SEC Filed Press Release Alcoa pleaded guilty to one criminal charge for violating the Foreign Corrupt Practices Act and will pay a fine. Alcoa will be responsible for paying 85% of a $223M payable in 5 installments. The only 15% will be paid by Alumina Limited which is still owned as a LT. Item # 3 Bought 70 AWC at $3.44-LT Category This matter has been around for awhile. Future Buys and Sells: I am not adverse to buying back some of the shares sold. I will be considering a 100 share purchase when and if the price declines back below $10 and possibly adding another 100 below $9. 4. Bought 50 PFGPRB at $24.42 (see Disclaimer): This was a very marginal buy, made primarily for diversification purposes in the fixed coupon equity preferred stock category. The FED's Jihad Against the Savings Class, now in its sixth year, has started to wear me down. For 2014, given the current valuations of stocks, I am going to placing more of an emphasis on income generation. And, given the uncertainty about the future course of interest rates, I am likely to be playing small ball with purchases of equity preferred stocks throughout the year. Security and Company Description: The Principal Financial Group Inc. 6.518% Non-Cumulative Perpetual Preferred Series B (PFG.PB) is an equity preferred stock that pays non-cumulative and qualified dividends. The issuer is the Principal Financial Group Inc. (PFG ), a "global investment management leader offering retirement services, insurance solutions and asset management". Currently, PFGPRB is paying dividends at a 6.518% fixed coupon on a $25 par value. At that rate, the dividend yield would be about 6.67% at a total cost of $24.42 per share. I have a "BBB" comfort level with this security which explains why I was willing to accept 6.67% for just a 50 share lot. The fixed coupon rate may change to a floating rate in 2035, as described in the prospectus, based on a 2.1% spread to the highest of the 3 month Libor, the 10 year treasury or the 30 year treasury. That kind of float provision is similar to the one now in effect for SCEDN which I own. The rate may also be at a different fixed rate coupon. All of that is meaningless to me, since I will not be holding this security for more than a year or two. More information about the reset in 2035 can be found starting at page S-16 of the prospectus. The security is not callable by the issuer until the dividend payment date in June 2015. The Dividend Stopper Clause is the legal means by which the preferred share's preference right to dividends is enforced against the common share owners. As a rule, a company can not make a distribution on a junior security and then eliminate or defer, as the case may be, the distribution on a more senior security. An equity preferred stock is senior to common in the capital structure, but is junior in priority to all bonds. Rationale: This was a marginal buy solely for income generation. None of my income producing securities make any difference in isolation. I focus instead on the aggregate generation from all such securities. PFGPRA adds a barely detectable portion of that income production. As noted earlier, I am also attempting to increase my income generation this year by at least $5,000. To accomplish that goal, I need to add more individual bonds and equity preferred stocks, preferably after a meaningful correction in the bond market. Other ways to accomplish that objective will be swap higher yielding securities for lower yielding ones. Some of my low yielding bonds include ARU and ISM. Hopefully, stocks are in a correction phase which will allow for the purchase of dividend paying stocks at lower prices. Part of the goal can be achieved through dividend increases. Risks: The company discusses risk factors starting at page S-8 of the Prospectus. A more in depth summary of risks can be found starting at page 18 of the 2012 Annual Report, SEC Form 10-K.
For fixed coupon equity preferred stocks, interest rate risk is generally at the top of my worry list. If rates rise then the owner of a fixed coupon preferred stock will have two undesirable choices. Keep the security as it falls in value or sell it at a loss in order to buy a similarly rated security with a higher yield. And, the flip side is not much better. If interest rates fall significantly, so that the issuer can refinance at lower rates, the security can be redeemed at par value, when legally permissible to do so, leaving the investor with proceeds to buy a replacement security with a lower yield, or possibly the same yield with a riskier security. The foregoing description is what is known as an asymmetric risk split between the issuer and the owner. Tails the issuer wins, heads the owner loses. Credit risk can certainly become important, but I do not view that risk as significant for this security at the present time. Volatility risk is a major issue for equity preferred stocks. 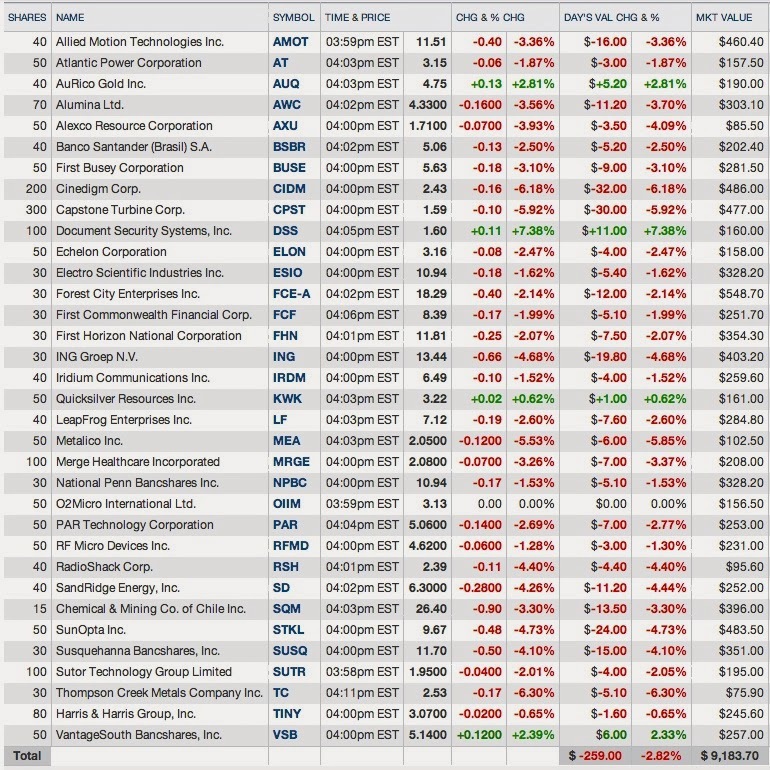 Future Buys and Sells: I will need a lower price and more yield to buy another 50 shares. I would consider buying another 50 at below $23 per share. Security and Company Description: Independence Realty Trust (IRT) is a small cap REIT that owns apartments. The company went public in August 2013 by selling 4 million shares at $8.5. Independence Realty Trust, Inc. Announces Pricing of Public Offering; Prospectus The REIT was formed in March 2009 and was spun out of RAIT Financial Trust which remains a majority owner. Last Friday, Independence Realty Trust announced that it had sold 7M shares at $8.3 with an over-allotment option of up to another 1.05M shares. RAIT bought 1,204.819 shares. In the initial announcement of this offering, IRT mentioned that RAIT might buy up to $10M in shares.That offering caused the stock to slide some, so I then bought 50 at $8.17 in the Roth IRA. As of 9/30/13, the REIT owned nine apartment complexes containing 2,358 units. The average monthly rent per unit was $789 and the occupancy rate was at 94.1%. In September 2013, IRT acquired a 354 unit complex near Indianapolis for $13.25M. In October 2013, IRT bought for $65M five apartment complexes located around Oklahoma City, OK. Independence Realty Trust, Inc. (Form: 8-K). IRT Website: Independence Realty Trust, Inc. Subsequent to my first purchase, a favorable article about IRT was published by Seeking Alpha. Recent Earnings Report: For the 2013 third quarter, IRT reported a 50% increase in core FFO to $1.3M. Core FFO per share increased 6% to $.17. The current consensus FFO estimate for 2014 is $.88 per share. IRT Analyst Estimates Four analysts contributed to that consensus estimate. Rationale: The primary rationale is income generation, with a monthly dividend which is always preferred here at HQ. At a total cost of $8.87 per share, and assuming a continuation of the current $.06 per share monthly dividend, the yield would be about 8.12%. The dividend yield at a $8.17 total cost would be about 8.81%. Risks: One of the risks is that this REIT does not have much of a track record, and there is consequently insufficient information to evaluate management capabilities. The company discusses risks incident to its business starting at page 15 of its IPO Prospectus. Some of those risks are related to its advisory agreement with RAIT. I much prefer REITs that are internally managed which avoids certain kinds of conflicts (see page 21). I view the external management arrangement as a negative which will cause me to limit my exposure to this stock. While most of the apartment complexes have undergone renovations within the past decade, they are relatively old with one exception. Recurring maintenance expense may be a major item going forward. I did not see an adjusted funds from operations (AFFO) number that subtracts ongoing capital expenditures from FFO. My inability to quickly locate that number is viewed as a major negative. It is consequently hard to evaluate whether or not IRT's dividend is sustainable long term. The dividend payout needs to be below the AFFO number, sometimes referred to as CAD (Cash Available for Distribution). Otherwise, the company is not keeping enough cash to fund ongoing capital maintenance expenditures. The AFFO is particularly important for an Apartment REIT and even more critical when the REIT owns older apartment complexes. When the dividend payout is consistently above AFFO, that will generally require a dividend cut as noted in previous posts. Commonwealth REIT: FFO and CAD Distinction; Item # 3 BOUGHT 50 BDN at $11.7. Future Buys: I may add up to another 150 shares at lower prices, preferably in the $7.5 to $7.75 range, provided I become more comfortable with this new REIT. I am not comfortable now owning more than 150 shares. I am not going to buy more shares until I have a better grasp of the AFFO number. 6. Sold 150 ACG at $7.54-Regular IRA (see Disclaimer): The AllianceBernstein Income Fund (ACG) is a leveraged CEF that invests mostly in investment grade bonds, with close to 70% of the portfolio weighted in AAA rated securities (i.e. low yielding treasuries). Rationale: This bond CEF popped on news that certain shareholders demanded that the fund allow shareholders to vote on open ending this fund. If that vote was successful, which is open to question, then the fund would start to trade at net asset value. Two thirds of the shares must be voted in favor of this proposal for it to pass, and I agree with a Morningstar commentator that this is not likely. The discount to net asset value had shrunk to -8.28% as of 1/17/2014. If the shareholders vote against open ending, this low yielding bond CEF would likely fall to a 11% to 13%+ discount to net asset value. Given the low yield, and the use of borrowed funds to buy low yielding investment grade bonds, I preferred to take my profit rather than to take a chance on that vote. As noted in my discussions of this bond CEF, I view it as a marginal buy even as a trade which is what I have being doing with this fund. I am doing nothing other than attempting to flip this one for small profits after collecting a few dividends. Future Buys and Sells: I am in a trading mode for this bond CEF. If this fund remains a CEF, I will consider repurchasing a small lot when the discount is between 13% to 15%. There are several considerations that would keep me from buying even a token number of shares even with a 15% discount to net asset value per share. At the moment, the fund is able to earn a net interest spread between the cost of borrowed funds which are abnormally low and the yield generated by bonds purchased with those short term borrowings. When the FED starts to raise the federal funds rate, the net interest spread will shrink as borrowing costs go up. This may start to occur in 2015. It would not take much of an increase in short term rates to wipe out the yield of treasury securities bought with borrowed funds given their low yields. If the values of those securities are declining as well due to a rise in intermediate and long term rates, caused by a rise in inflation and inflation expectations and/or interest rate normalization, then this fund is going to be suffering as a result. The worst possible scenario for a leveraged bond CEF is for their borrowing costs to go up and the value of their bonds go down at the same time. That would likely cause a steepening of the discount and create even more unrealized losses for investors. The dividend would likely be in danger of being cut too which would just add to the woes. As of 1/24/14, the discount was -7.79%. I will use the proceeds to buy a higher yielding bond CEF. 7. Bought 50 AMHPRA at $24.55 (see Disclaimer): This one is very unusual. I do not recall seeing anything like it. While the par value started out as $25 per share, that par value can be increased as explained below. In exchange for that potential, the investor has to accept a lower coupon currently. Security Description: The American Homes 4 Rent 5% Participating Preferred Series A (AMH.PA) is an equity preferred stock that pays cumulative dividends. The issuer is a relatively new REIT known as American Homes 4 Rent (AMH), formed in 2011 to buy, renovate and lease single family homes. As of 9/30/13, AMH owned 21,267 homes in 22 states, with a 96% lease rate after a 90 day rent ready period. To understand this one, the investor is going to have to spend some time reading the prospectus. I am just going to hit some of the peculiarities. Initially, the issuer will pay a 5% fixed coupon on a $25 par value. The par value can be increased by 50% of the cumulative increase in home price appreciation starting on 6/30/13, calculated using an index tracking the price in AMH's 20 top markets weighted by AMH's total investment as of 7/31/13. The House Price Index used in this calculation is published by of the Federal Housing Financing Agency and is called the non-seasonally adjusted "Quarterly Purchase-Only Index". (link to press releases published by the FHFA: Federal Housing Finance Agency - News Releases This is a link to the 2013 third quarter report: www.fhfa.gov.pdf (table 2 at page 15). Please note the heading in bold type about a 9% cap. This one has the potential to hit a 9% internal rate of return by September 2020 (5% coupon +4% HPA). A 7% internal rate of return may be more likely than 9% in my estimation (future guess!) given the 50% participation rate in the HPA. 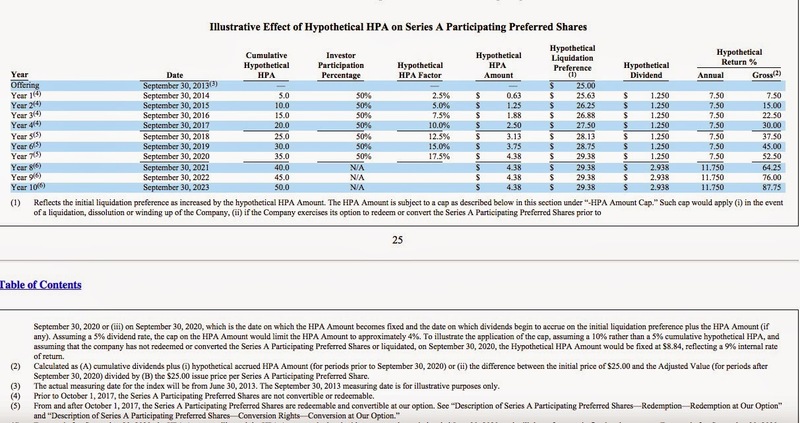 If AMHPRA is not redeemed or converted into common shares before 9/30/2020, the dividend rate becomes 10% paid on the $25 par value plus the home price appreciation amount (HPA). Even with no increase in the liquidation amount, there would be an incentive to redeem due to the spike in the coupon. Adding a significant HPA to the $25 par value, and then tacking a 10% coupon onto that total, would be a powerful incentive for the issuer to redeem or to convert the preferred shares into common shares. Consequently, this security has far less interest rate risk than a typical equity preferred security due to the likelihood of a 2020 redemption and the potential increases in the principal amount by the HPA calculation. The conversion into common shares, one of the possibilities, or a redemption can happen at AMH's option after 9/30/15. The HPA amount will be realized upon the exercise of either option. The conversion calculation is beyond the scope of this blog and can be found in the prospectus. The last ex dividend date was on 12/11/13. Rationale: This one is like a floater in some respects. It provides a minimum coupon and the possibility of a greater return based on the home price index. As noted above, it is highly likely that this one will be called or converted into common shares before the coupon spike to 10%, with that coupon paid on a combination of the $25 par value and the HPA. That limits interest rate risk since the issuer has a powerful incentive to get rid of the security. The HPA increase is also an inflation hedge of sorts. Traditionally, home prices have increased around 1% over the inflation rate. Risks: A summary of the risk factors is made by the company starting at page 13 of the prospectus. What could go wrong with housing prices? Home prices have been recovering since the bursting of the housing bubble but are still significantly below their 2006 highs in most localities. Case Shiller 20 and 10 City Indexes October 2013 (indexes off 20% from peak 2006 level as of October 2013). There is certainly no guarantee that home prices will cumulatively increase from 6/30/13 until the time of redemption or conversion. If there is no increase, then the investor forfeited around 2% or so in current coupon going with this strange security rather than a plain vanilla fixed coupon equity preferred issued by another REIT. Notwithstanding that cautionary statement, I would view a 4% annual increase before the 50% participation rate (2% after) to be a rational forecast based on what is known now. It could be higher due to many localities still struggling to return to trendline appreciation. The acceleration in home prices from the 2008-2009 lows has started to slow down. Credit risk may be the most serious risk for this one. There is also a risk in just not knowing now the data relevant to the possible conversion rate into common shares. Future Buys and Sells: Over the next year, I will be monitoring the increases in par value originating from the Home Price Appreciation Amount (HPA). Along with other factors, including an assessment of the credit risk, I will consider buying another 50 shares at below $23.5. Kristallnacht, known as the Night of Broken Glass, is when the NAZIs attacked Jewish owned stores and synagogues, smashing their windows, ransacking the buildings, burning 1000 synagogues and murdered 91 Jews and sent 30,0000 to concentration camps. Perkins made a fortune investing other people's money in companies started by other people, the ones with the actual talent and ideas. His estimated net worth is $8 billion. I was under the mistaken impression that the treatment of the top 1% was actually very good in the U.S., most everything is geared to enhancing their wealth and the wealth gap with everyone else. Their share of the national income has grown exponentially over the past two decades. Apparently, Mr. Perkins believes that he and his compatriots in Silicon Valley and elsewhere deserve everything being produced in the U.S. The top 1% captured 95% of the income gains between 2009-2012. Between 1993-2012, the top 1% grew their real incomes by 86.1%, while the bottom 99% had a 6.6% increase. (table 1, berkeley.edu/.pdf) The 400 richest Americans have more wealth than 1/2 of American households combined. Maybe we all need to say a prayer or two that our society will start treating Mr. Perkins and his ilk better. 2. Still Waiting for 2012 Tax Refund: I will never ask the IRS for a refund again. For about six months, I would check the worse than worthless IRS website about once a month, inappropriately named by the government: " Where's My Refund - It's Quick, Easy and Secure" Yes, that site was easy to you, but neglected to dispense any useful information such as where is my refund. Until early December, I was informed by that site only that my return was being processed. Then, in early December, the site informed me that the IRS had no record that I had even asked for a refund. I then discovered how a citizen actually talks to a person at the IRS. When calling their number, simply do not respond to any of the prompts, just act stupid. Eventually the computer gives up and transfers you to a person which is not an option in the prompts. After holding for about 20 minutes and then working with the government representative for another 30 minutes, including hold time while he checked something in my records, I found out why I had not received my refund. The government owed me almost $500 more than I requested and had never let me know that fact, until I called them. I was promised a check within 30 days. It has now been 40 days and still no check. I was hoping to receive that refund before I filed my 2013 tax return in April or at least before I passed away. The later may be the most likely option. Now, if I owed the IRS money, the shoe being on the other foot so to speak, I suspect their response time would be much quicker. Someone who knows about such things suggested that I might even receive interest on the delayed refund, but that assumes I will receive one. The Lottery Ticket and Regional Bank Basket strategies are normally updated on the last Monday of each month. The following two tables will have closing prices from the previous Friday. I decided to publish the update today and include an introductory discussion of the Vix Asset Allocation Model and the Asia Contagion from 1997. My weekly blog will be published on Monday or Tuesday next week. That crisis caused a Trigger Event in my Vix Asset Allocation Model. 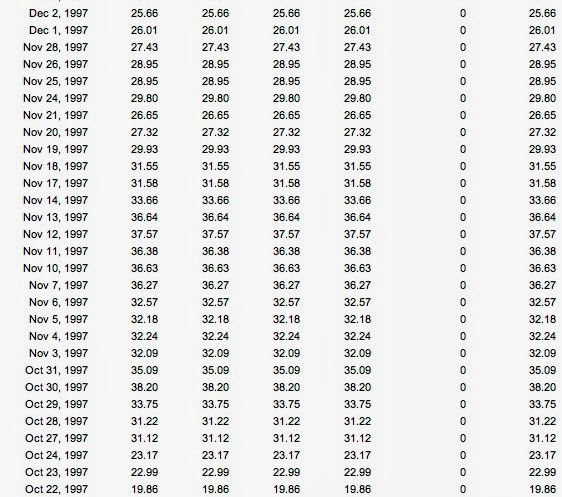 VIX Historical Priced (data starting on October 27, 1997 shows a Trigger Event under that model) The subsequent Unstable Vix Pattern lasted until January 2004. The foregoing was easy to classify as a Trigger Event under the Vix Asset Allocation Model. Note the duration of the move over 30 and the rapid rise from 19.85 to 23.17 and then to 31.12. The lower left hand corner shows the end of the Stable Vix Pattern while the lower right hand corner shows the start of the January 2004 to August 2007 Stable Vix Pattern. In between, the market remained in an Unstable Vix Pattern, viewed as dangerous for most investors other than very talented and frequently lucky traders. My current guess is that the latest emerging market meltdown will not cause a Trigger Event. Last week Argentina's peso fell 15% and more declines may be in store this week. Bloomberg Occasionally, I will venture into Argentina with a LT buy, the last being GGAL which was sold last year. Sold LT GGAL at $9.6 I suspect that it is too early to buy back those 40 shares. BOUGHT 40 GGAL at $6.72-LT Category I have another Latin America stock under review for a possible LT purchase, with operations in both Argentina and Venezuela, two of the worst nations in the world for business. But, as our RB is fond of saying, at least a business owner may be able to fire someone in those two countries, unlike France, for pretending to work. A. Capstone Turbine: On 1/9/13, Capstone announced that it had received multiple orders totaling 6.4MW of electric power. Those turbines orders are for use in the Marcellus and Utica shale plays. The price retreated some in last week's rout, closing at $1.59. B. Banco Santander Brazil (BSBR): BSBR declared a $.66728 per share dividend which went ex dividend on 1/10/2014. This was on top of another $.11342 per share dividend which went ex dividend on 1/7/2014. Banco Santander Brasil (BSBR) Dividend History This distribution is part of a capital restructuring discussed by Moody's which reaffirmed the bank's credit ratings. The two other divisions are Industrial Chemicals and Specialty Plant Nutrition. SQM's share of the worldwide iodine and lithium markets come from a Morningstar report. Another report prepared by an investor has higher numbers. reyndersmcveigh.com/research I did not attempt to establish which estimate is accurate or closer to being accurate. For my purposes, it is important only that SQM has a significant market share. The swoon starting in July was caused by Russia's Uralkali quitting its partnership with Belarusian Potash that set off concerns about a price war in potash, which accounted for almost 28% of SQM's revenues for the first nine months of 2013. Twelve analysts following the company and most have the stock rated at neutral, underperform or sell. Reuters.com An overall pessimistic view shared by the herd is a standard feature for stocks selected as Lottery Tickets. For the 2013 third quarter, SQM reported net income of U.S.$138.9M or $.53 per share, down from $.63 per ADR share in the 2012 third quarter. The current consensus E.P.S. estimate is for $2.08 in 2013 and $1.95 in 2014. SQM Analyst Estimates I would not put much faith in those forecasts. 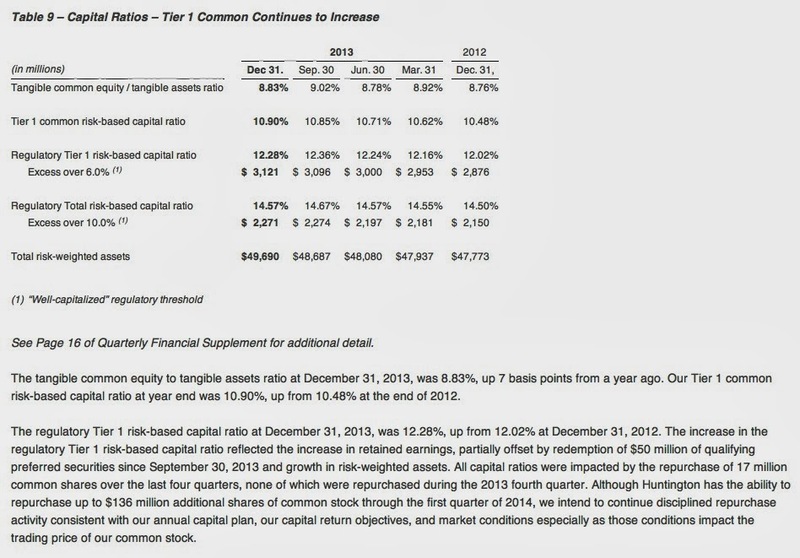 The company does pay dividends semi-annually that will fluctuate based on earnings. 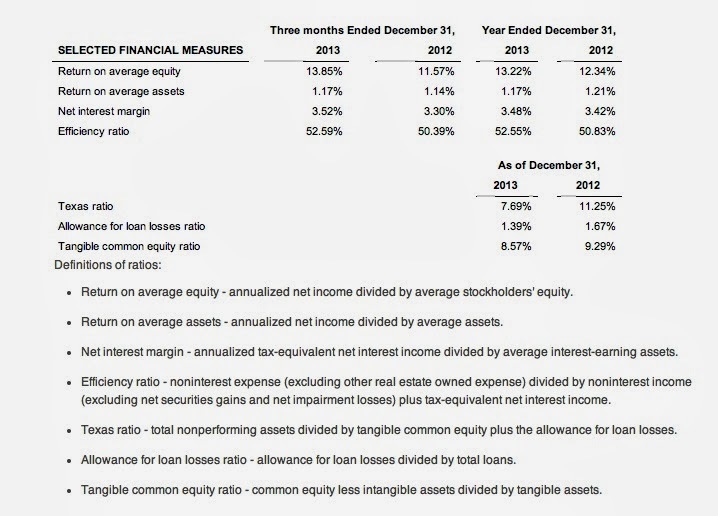 The payout in 2013 was based on 50% of net income before amortization and negative goodwill. The 2013 annual payout was $1.03946. SQM Dividend History-NASDAQ.com Chile has a withholding tax (35%-subject to reduction), and then there will be a ADR administration fee deducted from the payout in addition to that tax. Consequently, I would not own shares in a retirement account. This is a link to articles about SQM published by Seeking Alpha. While I was already familiar with the company, I did find the overview given in this Seeking Alpha helpful. Uralkali recently signed a new potash contract with China, taking a 24% price cut from the $400/mt set in the prior contract. Reuters Bloomberg WSJ.com Possibly, potash prices have stabilized at around $300/mt, but I would not expect much upward movement over the next year or two unless Uralkali and Belaruskali start cooperating again in their pricing and marketing. That is a possibility given the recent management change at Uralkali. I took a hit last Friday in this basket, hurt particularly by FNFG. A. Huntington Bancshares (HBAN): Huntington Bancshares reported net income of $157.8M or $.18 per share, down from $.19 in the 2012 4th quarter. The consensus estimate was for $.17 per share. This report is discussed in this article published by TheStreet. The CEO noted that the rise in longer term interest rates did not do "much for most bank's interest margins, because certain loan types, including home equity loans and equipment leases keep repricing lower, because the federal funds rate remains in a range of zero to .25%". Analysts do not expect E.P.S. growth 2013-2014. The current consensus E.P.S. estimate is for $.72 in 2014. HBAN Analyst Estimates E.P.S. for 2013 was $.72. B. Citizens and Northern (CZNC): For the 2013 4th quarters, CZNC reported net income of $.34 per share, down from $.48 in the 2012 4th quarter. SEC Filed News Release The estimate, made by just one analyst, was for $.4 per share. The NPA ratio increased to 1.53% from .83% as of 9/30/13. The NPL ratio increased to 2.8% from 1.45%. Both of those increases are troubling and reflect the primary source of the earnings downdraft. The bank had to increase its provision for credit losses to $1.559M during the 4th quarter from $239,000 in the prior quarter. The coverage ratio declined to 47.95% from 75.63%. Overall, this was a poor report. For 2013, CZNC reported net income of $18.594M or $1.5 per diluted share, representing "an annualized return on average assets of 1.5% and an annualized return on average equity of 10.25%". The dividend yield at my total cost is over 5% based. The quarterly rate was $.25 per share: Citizens & Northern Corp (CZNC) Dividend History I was surprised to see a one cent increase to $.26 per share. Citizens and Northern Bank | C&N Declares Dividend At a total cost of $19.15 per share, the yield becomes 5.43% at the new quarterly rate. Given the good capital ratios and dividend yield, and considering that I am almost playing with the house's money, I have decided to stay with the 50 share position until I review the next earnings report. C. Sold 50 Union Bankshares (UNB) at $24.56 (see Disclaimer): Union Bankshares, a small bank headquartered in Morrisville Vermont, reported 4th quarter net income of $1.5M or $.34 per share, down from $.5 in the 2012 4th quarter. The bank did not realize any gains from the sale of securities compared but did recognize a $629,000 gain in the 2012 4th quarter. E.P.S. for 2013 was reported at $1.6, up from $1.54 in 2012. At a $24.56 price, the TTM P/E is 15.35 which I view as slightly expensive for a small bank barely growing its earnings. I decided to sell my position. If I had waited another day, I could have transformed the profit into a long term capital gain so the timing was deficient in that regard. 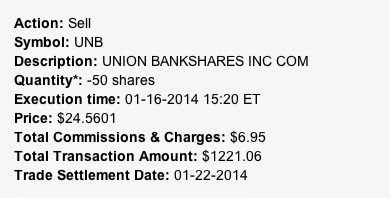 This is my second round trip in UNB shares. I will consider buying this lot back at below $20, preferably below $19. D. F.N.B. : For the 4th quarter, F.N.B. reported operating net income of $32.5M or $.21 per share. E. Trustco (TRST): TrustCo reported 4th quarter net income of $10.6M or $.112 per diluted share, up from $.104 in the 2012 4th quarter. The consensus estimate was for $.11. F. Community Bank System (CBU): For the 2013 4th quarter, Community Bank System reported an adjusted E.P.S. of $.54 which excludes $.04 of acquisition expenses and a $.12 per share after tax loss relating to the disposition of securities. As of 12/31/13, the NPL and NPA ratios were at .49% and .32% respectively. The coverage ratio was at 201%. Earnings Call Transcript - Seeking Alpha (Loan growth was seasonally atypical in the 4th quarter, up 8% on an annualized basis; during the quarter, CBU closed its acquisition of 8 BAC branches in northwestern PA; banking fee income 9%; revenue growth in wealth management and benefits administration up 11%). G. National Penn Bancshares (NPBC): National Penn Bancshares reported adjusted E.P.S. of $.17 per share for the 2013 4th quarter. H. First Niagara (FNFG): I am sitting on an unrealized loss in my FNFG shares, and I contemplated buying another 50 shares last Friday. But the LB noted a pearl of wisdom, frequently ignored here at HQ by the OG, that an investor who is in a hold needs to quit digging. Fortunately I have resisted that temptation so far with FNFG. My loss in FNFG was caused by the boneheaded decision made by FNFG to acquire branches from HSBC for $1B in cash. To raise the funds for that ill advised purchase, the Board slashed the quarterly dividend by 50% and sold a boatload of stock and other securities at unfavorable terms for existing shareholders. First Niagara: Just Another Incompetent Bank Board of Directors; First Niagara Dividend Slash It will likely take more than a decade for the quarterly dividend to be restored to its 2011 level of $.16 per share. First Niagara Financial Group Inc. (FNFG) Dividend History While the Board replaced the CEO responsible for that decision, Board members who approved of a clearly improvident acquisition are still around, I will vote against all of those board members for a very simple reason. Their lack of good judgment has already been amply established by approving the grandiose plans of the former CEO. The shares slid last Friday in response to FNFG's earnings report and conference call. The bank guided down 2014 operating income to $.72 to $.75. The consensus estimate was for 79 cents. The bank is going to spend more money on new products and service platforms. First Niagara reported net income attributable to common shareholders of $70.1M or $.2 per share. This was in line with the consensus estimate. The capital ratios are low for banks in my basket. On the bright side, I am reinvesting the dividend, a parody of its former self, to buy shares which have become cheaper as new management tries to enhance operating underperformance. I am now an involuntary long term holder of FNFG stock. FBR Capital downgraded the stock to market perform from outperform last Friday. I. West Bancorp (WTBA): For the 2013 4th quarter, West Bancorporation reported net income of 4.3M or $.27 per share, up from $.22 in the year ago quarter. The Board declared an $.11 per share quarterly dividend. Total non-performing assets dropped to the lowest level since 2008. Overall, I view this as a good report based on the limited amount of data made available in the press release. The 10-Q for the third quarter showed the NPL ratio at .92% (page 47) and a total capital ratio of 14.08% (page 50). This small Iowa bank will provide more information about the 4th quarter when it files its 2013 Annual report in March.